On the sun-drenched Kohala coast on the Big Island of Hawaii, the elements have come together to create a place like no other. It is at this point of convergence that we have chosen to situate our residential community Hali’i Kai at Waikoloa. Perched on a bed of lava overlooking the coast, our luxury Waikoloa oceanfront villas take in the site's rugged terrain, fragrant blossoms, and ocean breezes. 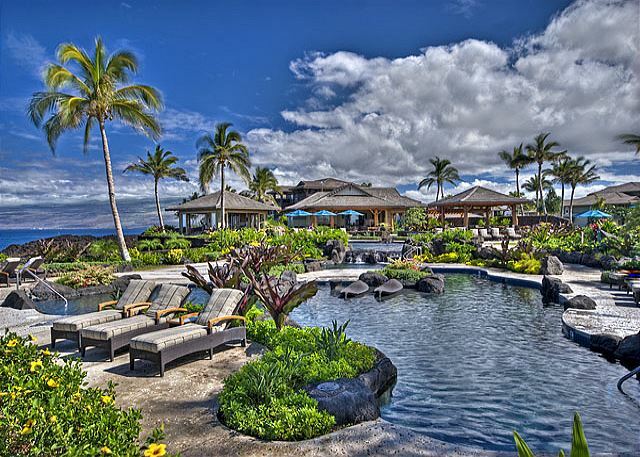 Located in the esteemed Waikoloa Beach Resort, the oceanfront island home community of Hali’i Kai ("Spreading out to the Sea" in Hawaiian) is built on 29 acres in a neighborhood of unmatched luxury. 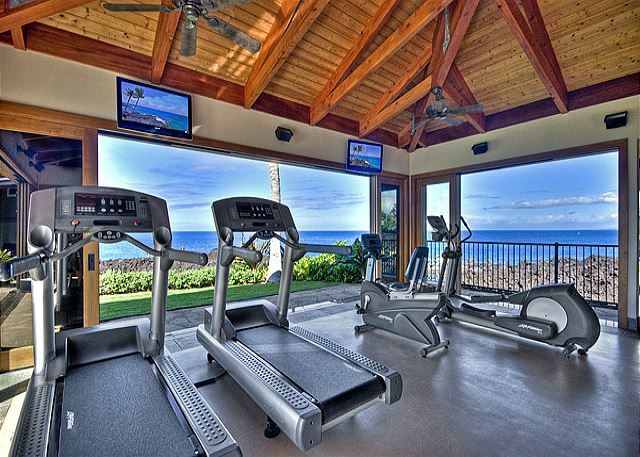 Here, you'll find your sanctuary, your playground, your Hawaii Island home. Daily Resort Fees included. If you are looking for elegance which surpasses any other, look no further. Over 1700sq of luxury living. This second floor luxury villa, accessible by stairs offers beautiful Island decor with art work from the Islands best artists. The master bedroom as well as the second bedroom are located on the 3rd floor. An additional bedroom is located on the same level as the livingroom/kichten area. This villa also offers full services to include daily light housekeeping services, mid-week cleaning if your stay is over 4 nights and the departure clean. Owner will not waive cleaning in favor of lessor rates please. All bath amenities are provided and refilled. First class all around providing for a most memorable Hawaiian vacation. 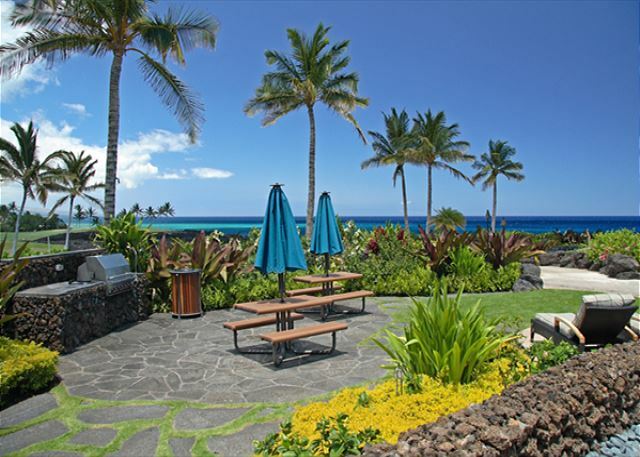 Enjoy island breezes and the swaying coconut palms and lava rock framing the breathtaking Pacific Ocean Aloha style. The view captures stunning sunsets and amazing stargazing. 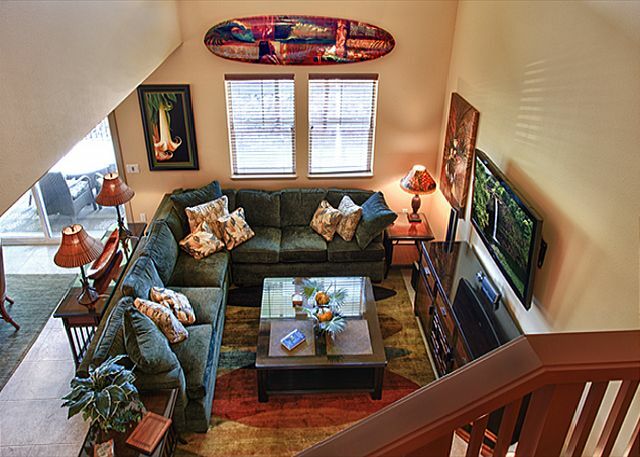 You will enjoy sitting on your lanai while watching the whales breach and frolic (during whale season this is the place to be). A wonderful place to enjoy stellar Ocean views, capture stunning sunsets and amazing stargazing. 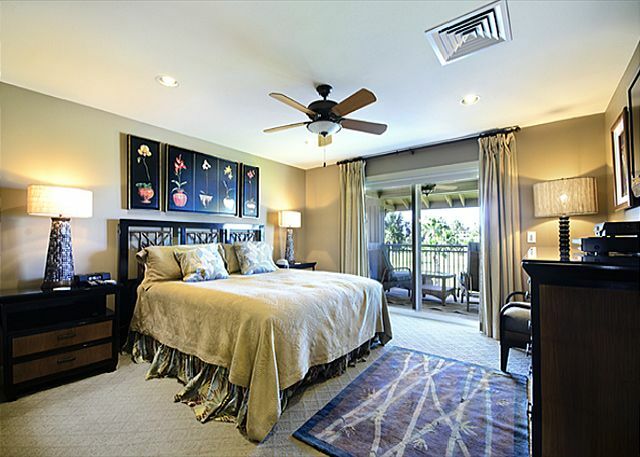 This villa offers unparallel views of the Pacific Ocean and the beautiful Waikoloa Beach Golf Course. 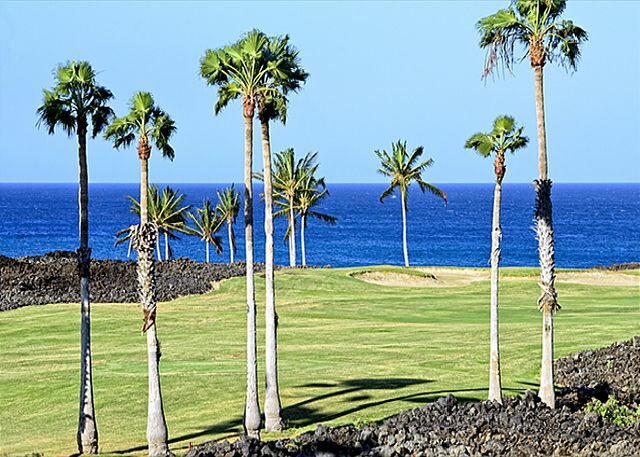 The Beach Golf Course designed by Robert Trent Jones Jr. winds its way through swaying coconut palms and lava down to the brilliance and power of the Pacific Ocean as it crashes on the lava behind the 7th green, a fabulous photo opportunity any time of day. 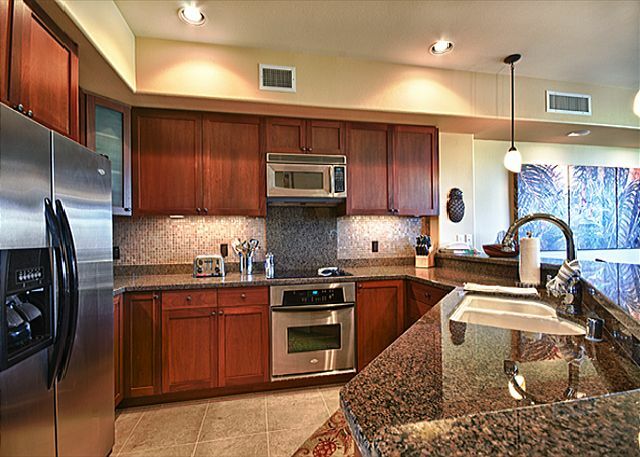 The gourmet kitchen has stainless steel appliances and granite countertops and provides everything you will need to enjoy your stay. The separate laundry room has a full size washer and dryer. This unit has AC and ceiling fans throughout. Hali'i Kai is located next to the Hilton Waikoloa in the Waikoloa Beach Resort approximately 18 miles from Kona Airport. This resort has a beautiful oceanfront multi-level pool, oceanfront open air fitness cabana and restaurant at the Hali'i Kai Ocean Club. The restaurant offers a selection of favorite Hawaiian cocktails and food. The resort has a tennis court and a basketball court for guests. Enjoy a walk along the beach to the Hilton right from Hali’I Kai. The Waikoloa Beach Resort is known for its two championship golf courses, restaurants and shopping. The beautiful Anaeho'omalu Bay is in a protected cove and has a beautiful sandy swimming beach with lounge chairs under the majestic palms trees and offers sunset and dinner cruises, paddle boarding, kayaks and snorkeling. There are two shopping centers; Kings Shops and the Queens Market Place, conveniently located about a mile away and offer an array of upscale boutique shopping, fine dining restaurants and fast food cafes along with a grocery store. Close by are several world class golf courses and beaches that offer fantastic water activities. Thank you for posting this review. We are happy to hear you had a pleasant vacation and enjoyed the Beach Club. We sincerely hope to see you again soon. Mahalo Wendy! We look forward to your return! the property was described accurately it was also very clean and well- maintained. Boundless Hawaii property management provided great customer service we would recommend them highly. Lots of walking, shopping, and great restaurants to choose from. Mr. Walsh we thank you for your extremely kind review of both the unit and our company! We would love for you to return and take advantage of our returning client discount! Everything went very well with out stay at Hali'i Kai 9F. Very smooth rental, easy to get in and get out. The condo was extremely well appointed and comfortable. I recommend this unit highly. The unit was just wonderful! Very well-appointed in every way. We had a wonderful time on the Big Island, and this was a great place to stay. The villa was beautifully furnished and well-cared for. There were nice touches in the unit, including a guidebook for the big island, and beach chairs. We highly recommend this unit. Excellent. The only issue was the shower door in the master bedroom slammed loudly shut if you did not hold on to it to close it. We had a wonderful time! The ladies at Boundless Hawaii were extremely helpful and the whole process was very organized. The apartment was in top condition, very clean, very spacious and cool. The grounds at the resort were amazing, the staff friendly and the amenities never seemed too crowded or rowdy, to take away from our experience. I would definitely come back and stay here again! 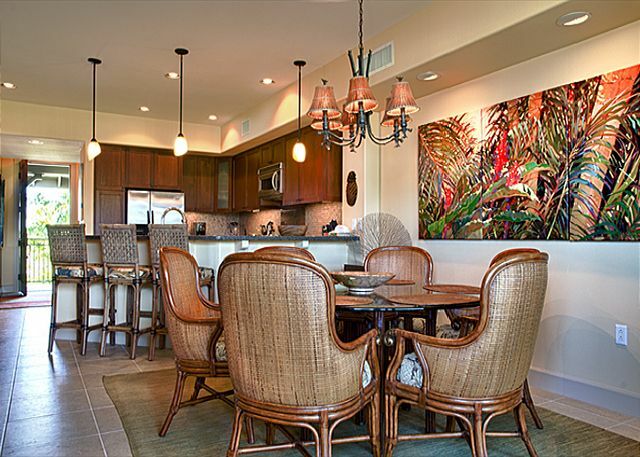 The property location and amenities were exactly as shown; the unit was beautiful inside and out, and having stayed in Kailua-Kona on all our previous visits, we would now make this our permanent Big Island vacation spot. The pool was fantastic, our kids didn't want to leave! Please put a coffee grinder inthe unit, though - when you're in the land of the best coffee in the world, you want to grind beans! Aloha! 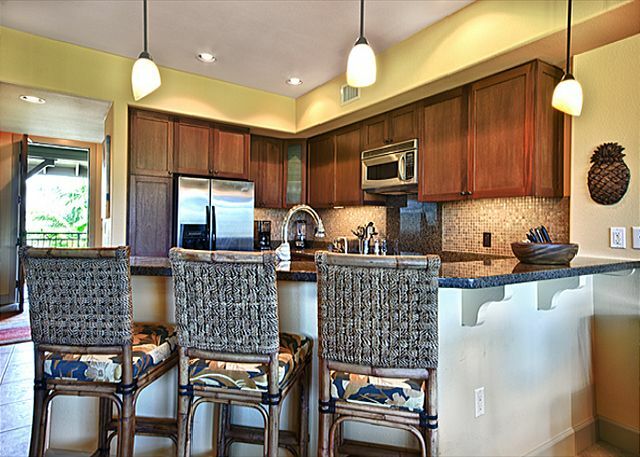 Hali'i Kai is quiet, but just a few minutes from the Waikoloa shops and the beach at Anaehoomalu Bay.